The Wage and Hour Law is a general labor law poster poster by the Hawaii Department Of Labor and Industrial Relations. This is a mandatory posting for all employers in Hawaii, and businesses who fail to comply may be subject to fines or sanctions. This poster must be posted in a conspicuous place where all employees will see it. This posters describes the minimum wage, how overtime is dealt with, the right employees have to be notified their rate of pay and paydays, that employers cannot withhold the wages from employees, employees have the right to collect unpaid wages, and the right for family leave if a child is born or adopted by an employee. Other rights include the right to be paid the prevailing wages on government construction projects, the right to refuse a lie detector test, the right to file a complaint if suspended, discharged, or discriminated against solely because of a work injury for an employee getting Workers' Compensation. It appears you don't have a PDF plugin for this browser. Please see the link below to download hawaii-poster-wage-and-hour20171215.pdf. employees” may be paid less per hour. intent ion to quit, you must be paid on your last day of employment. to the last day you intended to work  unless  you were terminated for cause. Withholding of Wages  -  You have the right to  ensure that there are no wrongful withholdings of your wages. received at the start of  a shift and all m onies turned in at the end of a  shift. •   Penalties or replacement costs for breakage. authorized you to accept checks. due to your willful or intentional disregard of the employer’s interest. professionals and outside salespersons may need to file a claim in a court of competent jurisdiction. sick leave per year unless a collective bargaining agreement provides for more than 10 days. right to  be paid the prevailing wages on government construction projects. Lie Detector Tests  -  You have the right to  refuse a lie detector test. e xcept under certain circumstances . 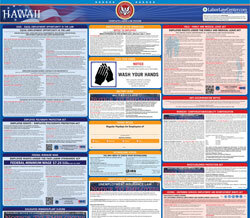 *   You may satisfy Hawaii Labor Laws’ posting requirements by posting our official labor law poste r.